Long a leader in national defense, the U.S. Army’s Fort Stewart recently crossed a threshold that shows it also leads in defending endangered red-cockaded woodpeckers. Fort Stewart and the U.S. Fish and Wildlife Service say the number of potential red-cockaded breeding groups at the 280,000-acre southeast Georgia installation has topped 350. Populations that size or larger are considered highly robust and less susceptible to environmental and genetic threats. A potential breeding group is an adult female and an adult male occupying the same cluster, with or without helpers, and whether or not they attempt to nest. A cluster is the collection of cavity trees where a family group roosts. Federal recovery criteria for down-listing these imperiled woodpeckers includes having at least 10 populations with 350 or more potential breeding groups across the species’ range. Fort Stewart is the fourth site to reach that mark. It joins Francis Marion National Forest, Fort Bragg and Eglin Air Force Base, a lineup that highlights the importance of military bases in wildlife conservation. The red-cockaded woodpecker population at Fort Stewart has almost doubled since 1996, when the Army and the Fish and Wildlife Service agreed to management guidelines. Those guidelines reduced military training restrictions in woodpecker habitat, increased the Army’s commitment to proactive habitat management, and established monitoring and reporting protocols. A family group occupies a cluster of cavity trees and varies from a single bird to a breeding pair, plus one to three helpers -- male offspring from previous years that help feed younger siblings. 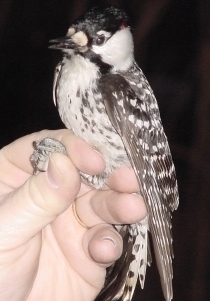 As red-cockaded woodpecker numbers eased upward, the guidelines were modified, allowing bases to train near clusters and providing extra incentive for increased conservation. Fort Stewart removed training restrictions from 90 clusters in 2010 and 39 in 2011, with another 96 eligible this year. According to the base, the continued growth of the red-cockaded woodpecker population is evidence that training is not having a significant detrimental impact. What’s having a positive impact? Management. The base conducts prescribed burns on thousands of acres, mimicking natural fires that burned across the landscape every one to five years before European settlement. Staff also uses single stem selection to thin timber stands rather than clear-cutting, allowing for a balance of age classes. Wildlife managers then install artificial cavities (below) in the improved habitat to encourage new family groups of woodpeckers to form. The red-cockaded woodpecker is the only woodpecker in the U.S. that excavates cavities in living pines. The drastic loss of mature pine forests has been the primary cause of this species’ decline. The forested grassland created by burning and thinning has not only led to a steady increase in the red-cockaded population, it’s more suitable for military training than the dense pine stands that covered parts of Fort Stewart before 1996. What’s good for soldiers is also good for this small, rare woodpecker. The Georgia Department of Natural Resources' Nongame Conservation Section works with Fort Stewart, other military installations and the U.S. Fish and Wildlife Service to help conserve red-cockaded woodpeckers. Nongame Conservation Section biologists also help with the Army Compatible Use Buffer program, which seeks to protect priority conservation lands surrounding military installations from incompatible development. Military bases provide red-cockaded woodpeckers to boost populations at other appropriate sites, such as Silver Lake Wildlife Management Area near Bainbridge. Learn more in the Nongame Conservation Section's annual report. With September here, it won't be long before the Georgia countryside is ablaze with fall foliage. But Mother Nature's autumn extravaganza is preceded by an opening act of fall wildflowers that is also quite spectacular. While everyone is familiar with one of the stars of this show, the goldenrod, a number of other flowers are also stunning. 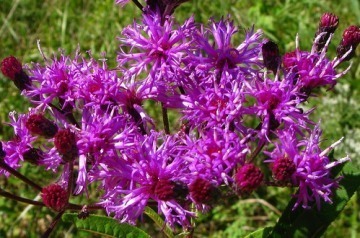 One of these beauties is the ironweed. Adorned with flowers, favored by butterflies and spurned by deer and rabbits, these native plants and cultivars are finding their way into markets and gardens across the Peach State. Terry W. Johnson is a former Nongame program manager with the Wildlife Resources Division and executive director of TERN, the Nongame Conservation Section’s friends group. His “Out my backdoor” columns are archived here. An ambitious, range-wide conservation plan developed by Georgia, Florida and the U.S. Fish and Wildlife Service is aimed at keeping gopher tortoises off the federal endangered species list. The Fish and Wildlife Service has determined that the gopher tortoise, the only tortoise native to the Southeast, should be protected under the Endangered Species Act in the eastern part of the species’ range. But, if partners are successful, that listing may be avoided. The Draft Range-Wide Conservation Strategy for the Gopher Tortoise, released in August, is a roadmap for private landowners and other partners to identify the highest priority conservation efforts for this unique animal, and the agencies and organizations best suited to undertake those efforts. Comments on the first draft are due by Sept. 15. (Comment here.) Additional comments will be sought as the document is further revised. One of the biggest challenges to gopher tortoise conservation is lack of information. 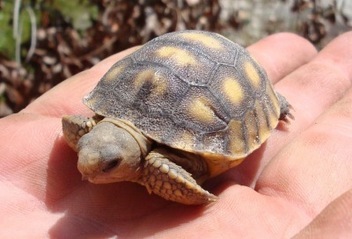 Specifically, despite dozens of peer-reviewed studies and advances in genetics and modeling, biologists still do not know what constitutes a viable population of gopher tortoises, how much habitat is needed to maintain that population, and how many total populations are needed across the landscape to ensure long-term stability. Answering those questions is one of the strategy’s five objectives. Address the current and threatened destruction or modification of gopher tortoise habitat. An estimated 88 percent of gopher tortoise habitat is on private land, which means achieving this objective will require great cooperation and coordination between the states, the Fish and Wildlife Service and private landowners. Minimize direct harm to gopher tortoises, including encouraging the conversion of the region’s two remaining rattlesnake round-ups to wildlife festivals. During the harvest of rattlesnakes for round-ups, gopher tortoises can be harmed. Investigate and resolve the impacts of disease and predators on gopher tortoises. Investigate range-wide regulatory mechanisms that could minimize the loss of gopher tortoises’ preferred habitat, and provide protection for relocated tortoises. Protection of the gopher tortoise is warranted under the Endangered Species Act. The Fish and Wildlife Service made that determination in 2011 based primarily on the tortoise’s declining habitat in the sandy soils of open pine forests. The species was not listed because of higher priorities, providing a ripe opportunity for proactive conservation in the next four to eight years. The gopher tortoise is state-listed as threatened in Georgia, where it’s also the state reptile. The species is federally listed as threatened in the western part of its range, which includes Mississippi, Louisiana and parts of Alabama. Stacy Shelton is a public affairs specialist with the U.S. Fish and Wildlife Service in Atlanta. In the summer of 1876, ichthyologist David Starr Jordan and his assistant set out to survey Flat Shoals on the South Fork of the Ocmulgee River in DeKalb County. 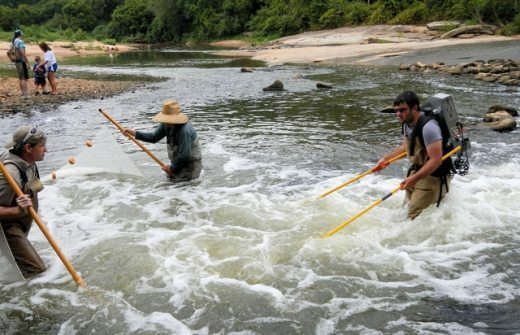 More than 100 years later, members of the North American Native Fishes Association and the DNR Nongame Conservation Section set out to sample the same stretch of river, following in the footsteps of one of the greatest ichthyologists ... and making some surprising finds. Read more in this Wildlife Resources Division blog post. Also, see photos of the fish survey this summer. Read the full report by Native Fishes Association Regional Outreach Coordinator Michael Wolfe. More than $1.8 billion was spent on wildlife-watching in Georgia in 2011, according to a just-released state overview of the U.S. Fish and Wildlife Service's 2011 National Survey of Fishing, Hunting and Wildlife-associated Recreation. Another standout stat: 30 percent of Georgians 16 or older – 2.2 million people – took part in wildlife-watching activities such as feeding birds or photographing animals. Efforts to oust flathead catfish from the Satilla River have removed 2,212 flatheads totaling 3,114 since April. Since 2007, when the Wildlife Resources Division started the program, the take has exceeded 33 tons of flathead catfish (program profile: "Satilla flatheads down, not out," October 2011). It’s not too late to vote on Georgia’s next nongame wildlife plate designs, or those for the Bobwhite Quail Initiative and trout management. Click here to take a quick survey and cast your vote! Sept. 15 is the deadline. Help plant native flowers at Panola Mountain State Park on National Public Lands Day, Sept. 29. Volunteers will plant native seeds and plants varying from rattlesnake master to native thistle from 9 a.m.-noon as part of grassland restoration at the park near Stockbridge. RSVP Phil Deleztrez, phil.delestrez@dnr.state.ga.us, or Charlie Muise, cmmbirds@yahoo.com. Georgians interested in native trees, shrubs and wildflowers on the coast can learn more through the Certificate in Coastal Native Plants Program. This popular outreach by the State Botanical Garden of Georgia and Coastal Wildscapes just released its fall class lineup, including sessions on barrier island ecology and native plant conservation. Nongame biologist Clay George coauthored a paper exploring interaction involving an entangled North Atlantic right whale. The research, published recently in the journal Marine Mammal Science, followed efforts in winter 2011 to sedate and disentangle a right whale that later died. Who are The Nature Conservancy’s “Heroes of the Altamaha?” Check them out, from William Bartram to Jane Yarn. A snake smuggler from Brazil was busted trying to ship 27 snakes stuffed in pantyhose and hidden in stereo speakers through Florida’s Orlando International Airport last month. Mateus Dal Maso Jr., who pleaded guilty, told federal agents he bought the snakes – including 19 corn snakes – at the National Reptile Breeders Expo and planned to breed them for commercial purposes in Brazil. Double-crested cormorants and bald eagles have rebounded in the Great Lakes region since the banning of contaminants such as DDT. Now, eagles are controlling cormorant numbers, by preying on the waterbirds and disturbing their nesting, according to research at Voyageurs National Park. Sept. 15: Georgia Naturalist Rally, Stone Mountain Park. Sept. 20: Agroforestry & Wildlife Field Day, UGA Griffin Campus. Sept. 21: Outdoor Learning Symposium, Environmental Education Alliance of Georgia, Gwinnett Environmental and Heritage Center, Buford. Sept. 26: 9 a.m., Georgia Board of Natural Resources , DNR offices, Atlanta. Oct. 4-6: Gopher Tortoise Council annual meeting, Kirbo Center at Bainbridge College, Bainbridge. Nov. 8: Georgia Exotic Pest Plant Council annual meeting and conference, Stuckey Conference Center, UGA Griffin Campus. The Nongame Conservation Section of Georgia DNR's Wildlife Resources Division receives no state funds to conserve nongame wildlife, native plants and natural habitats. Instead, we depend on contributions, grants and fundraisers, such as the eagle and hummingbird license plates. Buy or renew a plate. Contribute to the Georgia Wildlife Conservation Fund tax checkoff. Join our friends group TERN. Use GoodSearch (enter "Georgia Nongame Conservation Fund" at "Who do you GoodSearch for"). Learn more about the Nongame Conservation Section in our annual report . Georgia Wild is free, sent twice monthly and focused on rare, endangered and other nongame wildlife. Nongame includes wildlife not legally fished for or hunted, plus native plants and natural habitats. Georgia Wild copyright © 2012. Wildlife Resources Division Nongame Conservation Section. All rights reserved. BUY A WILDLIFE LICENSE PLATE! (Or renew one!) Support wildlife conservation in Georgia. Learn more.